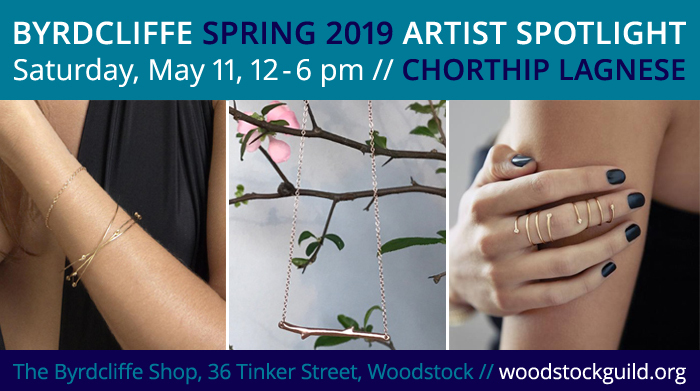 Byrdcliffe will be holding an ARTIST SPOTLIGHT for jewelry designer Chorthip Lagnese on Saturday, May 11, 12:00 to 6:00 pm at the Byrdcliffe Shop on 36 Tinker Street in Woodstock, NY. The Artist Spotlight will focus on Chorthip’s work, and everybody will be able to meet her at the Byrdcliffe Shop and find out more about the skills and fine artistry involved in her elegant and timeless jewelry items. Chorthip Lagnese is a former Tiffany&Co. jewelry designer and the recipient of several international design awards. Originally from Thailand, Chorthip’s training was in Industrial Design from the Silpakorn University in Thailand, the Fashion Institute of Technology in New York, and the Uno A Erre, in Arrezzo, Italy. She moved to New York City to study and work in the jewelry fabrication business and spent four successful years at Tiffany’s where she was one of the key designers on the Frank Gehry Jewelry collection. Since the launch of her own jewelry line in June 2009, under her name “Chorthip”, she has created several innovative jewelry collections, including: Infinity, Rain, Pebble, Spiral, Nugget, Wave, Knot, and Helix. Chorthip draws her inspiration from her strong cultural background in which nature plays a major role. Her jewelry proves to be timeless and has been called “where modern meets classic and elegant”. Chorthip works in her studio in the town of Woodstock, NY most days but you can find her on weekends practicing yoga, and chasing after her two young boys. Chorthip has been selected as one of 24 out of 250 applicants for the FIT Design Entrepreneurs 2019 contest. You can read about it here! 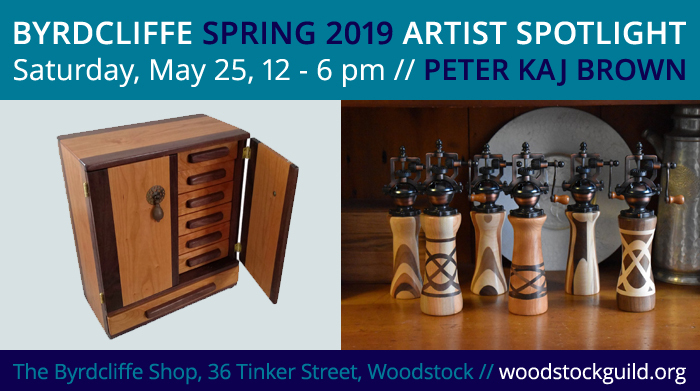 Byrdcliffe will be holding an ARTIST SPOTLIGHT for woodworker Peter Kaj Brown of PKB Woodworking on Saturday, May 25, noon to 6:00 pm at the Byrdcliffe Shop on 36 Tinker Street in Woodstock, NY. The Artist Spotlight will focus on Peter’s work, and everybody will be able to meet him at the Byrdcliffe Shop and find out more about the skills and fine artistry involved in his beautifully creative and functional wooden items. To Peter Kaj Brown, each tree writes its own story. Its grains and knots speak a history that is measured in decades and generations, telling of times and events that are only now dim memories and half-remembered fables. With each item he creates, care is taken to reveal the grains of the wood, allowing their stories to show through. Peter feels that when he makes something, his goal is always to bring out that beauty. He takes great pleasure and enjoyment in revealing the many and varied stories told in the different woods. An exquisite evening of dinner, champagne, pastries, and glorious sounds from Mozart to Miles. Please join us for this annual celebration of music across the ages. Enjoy a locally-sourced dinner followed by music, champagne, and dessert. And prepare to participate in our raffle of amazing items. 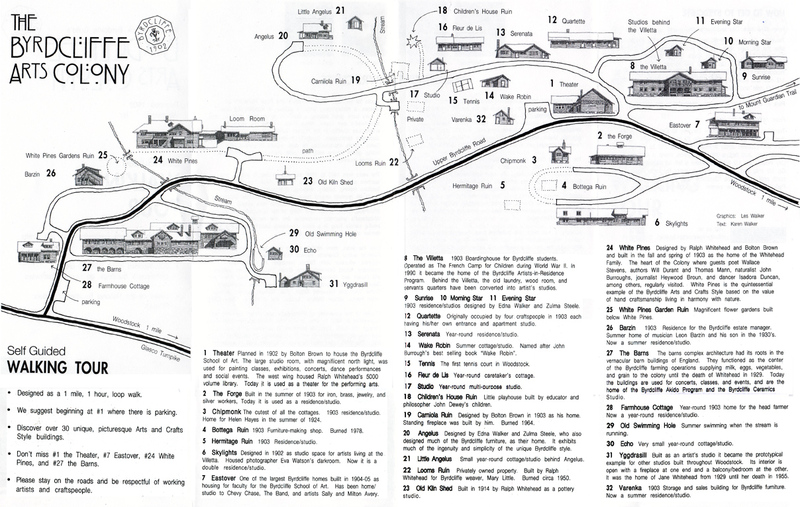 Proceeds for the events support Byrdcliffe’s arts programming. 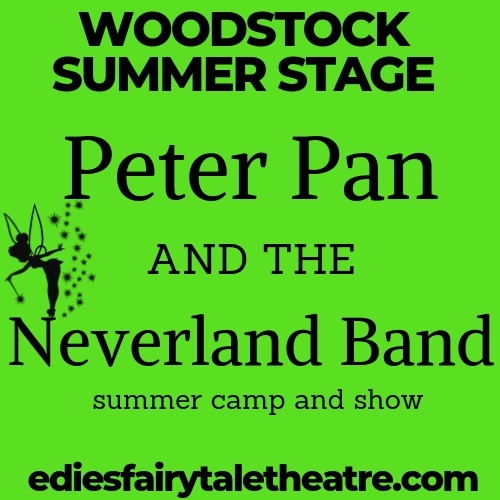 Tickets: $150 each ($75 is tax deductible); Benefactor $500 for two tickets ($350 is tax deductible); Patron $1,000 for four tickets ($700 is tax deductible) – buy your tickets online!